New Delhi 23 June 2017: As per the report by The Department of Science and Technology (DST), Govt of india is conducting a study to assess the feasibility of having different time zones. If all goes as per plan, there would be two different time zones in India soon, consequently need to change office timings too. As we know the timings of sunrise and sunset are different in Arunachal Pradesh from the mainland, similar is the case with the archipelagos of the Andaman and Nicobar and the Lakshadweep where sunrise and sunset timings are different from the mainland. 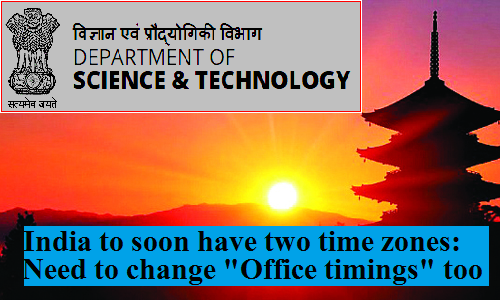 DST Secretary Ashutosh Sharma said that "Categorising two different time zones, would help in saving a lot of energy," The official further added that the study is being conducted to give "scientific inputs" on the matter. Primarily, the study has been initiated following the demand raised by Arunachal Pradesh Chief Minister Pema Khandu for a separate time zone for the Northeast. DST Secretary Shri Sharma said on the sidelines of a function organised to launch a commemorative stamp to mark 250 years of Survey of India, that "Not only time zones, there is a need to change office timings too, as there is no point in having one office timing across the nation. When the sun rises much in advance in Arunachal Pradesh and sets earlier than the mainland, what's the point in having office timings of 10 am to 6 pm? It could be changed from 8 am to 4 pm,"
The study is also expectedto cover the overall impact, especially on the transportation system. Leaders from the Northeast region argue that a separate time zone, a long pending demand would increase daylight savings and efficiency. One of the arguments is that early sunrise means that by the time they start their day, almost half the day has passed. This means an early sunset which requires extra use of lights in both homes, offices and public places hampering the productivity. Notably, the Gauhati High Court had in March dismissed a PIL seeking a direction from the Central government to notify a separate time zone for the Northeast as this part of the country is losing out on daylight hours while functioning as per the Indian Standard Time. In pre-Independent India, the British used to follow 'Tea Garden Time' or baagaan time zone, which is one-hour ahead of the current IST. The Department of Science and Technology (DST), Govt of india is conducting a study to assess the feasibility of having different time zones. If all goes as per plan, there would be two different time zones in India soon, consequently need to change office timings too.